8 cups broccoli chopped into bite size pieces. Add broccoli to steamer and cover; reduce heat to medium and cook 5-6 minutes or until pierce-able with a fork. While broccoli is steaming, melt butter in a small saucepan over medium heat. Add coconut or almond milk; bring to a simmer stirring frequently. Simmer uncovered for 1 minute. Remove from heat, stir in cheese until melted. 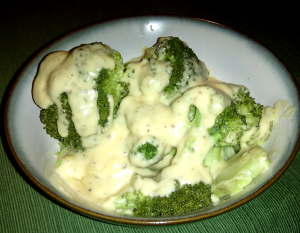 Drain broccoli, pour cheese sauce over the top, and serve!